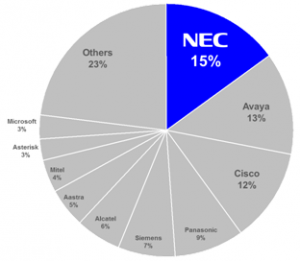 According to the T3i group report “Infotrack for Enterprise Communications Global market Intelligence Breifing for First Quarter 2013.” NEC’s global shipments were 15 percent of worldwide market share outpacing Avaya and Cisco. About Armstrong Telecom – Armstrong Telecom is an authorized NEC phone system dealer and has attained “Double Diamond” dealer status by maintaining high business standards and sales achievement. The Double Diamond standard at NEC is quite an accomplishment, Armstrong Telecom is one of only 17 Double Diamond dealers nationwide. Headquartered in Irving, Texas, NEC Corporation of America is a leading provider of innovative IT, network, communications and biometrics products and solutions for service carriers, Fortune 1000 and SMB businesses across multiple vertical industries, including Healthcare, Government, Education and Hospitality. NEC Corporation of America delivers one of the industry’s broadest portfolios of technology solutions and professional services, including unified communications, wireless, voice and data, managed services, server and storage infrastructure, optical and virtualized network systems, microwave radio communications and biometric security. NEC Corporation of America is a wholly-owned subsidiary of NEC Corporation, a global technology leader with a presence in over 44 countries and more than $37.5 billion in revenues.